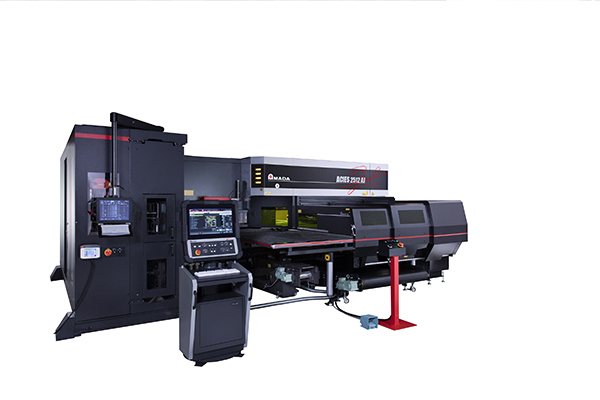 Recol Engineering Ltd, a Northampton-based subcontract supplier of metal-based manufacturing solutions, will become Europe’s first user of an Amada ACIES-2515TAJ 4 kW CNC fibre-laser profiling centre, complete with double-tower automation system. Recol is currently enjoying a period of sustained growth. Moreover, the company’s continuous programme of ongoing investment in the latest manufacturing technologies has never been healthier, as evidenced by Recol’s commitment to automated manufacturing solutions. Guntrip says that Recol is a company accustomed to “industry firsts”, and wanted nothing less for its investment in a new fibre laser. A team from Recol consequently visited Amada in Japan to assess the new ACIES-2515TAJ. Duly impressed, the company placed the order, making it the first machine of its type in Europe and only the second in the world outside of Japan. The ACIES-2515TAJ 4 kW fibre laser is capable of cutting materials up to 6mm thick, including copper, brass and titanium. Featured is a 300-tool, 600-die automatic tool changer with ID tooling system for complete tool management. “We will use the machine predominantly for processing stainless steel from 2.5 to 3.0mm in thickness, as this is where we will achieve the most gains, both for ourselves and our customers,” says Guntrip.